The subject today is wild turkey and I want to relay some interesting behavior and information about this bird. I will explain their social structure, breeding behavior, turkey calls and terms so you will know what others are talking about and even impress them yourself with your knowledge. I know most of you have seen a one, but I do want to describe what they look like for those of you that haven't. The tom has three areas on his head that will turn bright red. They are the caruncles, wattles and snood. The close-up of the tom's head in the picture on the left show these clearly. The tom has a large featherless head and throat with fleshy looking growths called caruncles. These caruncles turn red when he is angry or in courtship. His body is black with a large fan shaped tail and has rear spurs on the lower part of the leg that they use as weapons. He is substantially larger than the hen and his feathers have areas of red, purple, green, copper, gold and bronze. In the above photo, the tom has wattles under the throat and on the neck which are folds of skin, and the flap of skin that hangs over the beak of the tom is called a snood . The hen's head coloring is a grayish blue and she also has caruncles and a snood which is smaller than the toms. Their feathers are duller overall with shades of gray and brown. The tom will grow a cluster of hair-like feathers from the center of his chest called a beard; averaging 9 inches in length. Fifteen percent of the hen population also grow beards. It is not scientifically known why the wild turkey has a beard, but we have our own opinions. Wild turkeys are very agile and fly close to the ground for no more than a quarter of a mile. They roost in trees at night to protect themselves from predators. They have very keen eyesight. You can get away with some things in a tree stand when hunting for deer, but if the whitetail doesn't bust you for doing it, a wild turkey will. If you think that the wild turkey has spotted you, first look at where the head is pointing at. If they are looking straight ahead (beak facing you), you are NOT busted. The turkey must turn his head and look at you sideways to spot you. Always remember this. A predator (like us) has eyes in the FRONT of our head like: lions, wolves, tigers and bears. Wild game animals and birds have eyes on the SIDES of their head like: elk, deer, turkey, pheasant, etc and they are the hunted. Wild turkeys are very social and many turkey calls have been created to mimic the sounds they make. From calling in their young to mating calls the basic ones you'll hear are: gobble, yelp of a hen, cutting of an excited hen, cluck, purr, cluck and purr, putt, fly down cackle, adult hen assembly call, and kee-kees. Wow. 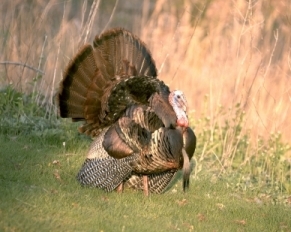 Early spring is mating season and the first sound of a tom in the area is hearing a gobble. This announces, "hey ladies, I'm here, ready to jump your bones; toms - get out of my way; or I'm going to be your worst nightmare." Or something like that. 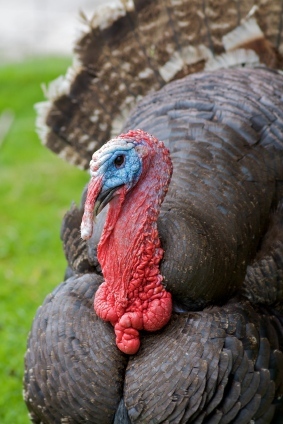 This gobble can be heard for up to a mile. He will also emit a drumming sound. The cluck reminds me of that of a chicken. One note or several. It's generally used to get another bird's attention. When hunting, it's a good call to use assuring the approaching tom that the "hen" is waiting for him. The normal yelp of a hen is a normal wild turkey sound that you hear and has different meanings on how the sound is relayed. Basically they will yelp to let the mature toms know where they are. The toms have also been known to yelp like the hens. Hens can gobble, but rarely do. The cutting of a excited hen is a series of fast, loud single notes; like a modified cluck. You can hear this a long ways away as the gobble and it basically means the same thing...she needs companionship. 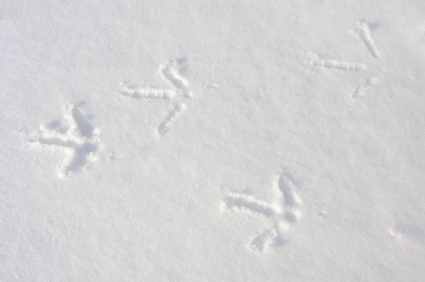 NOTE: Look for tracks that are 2-1/4 inches or larger. If you can clearly see the imprint of the scales on the middle toe, this indicates a heavy bird. The adult hen assembly call is a series of loud yelps used to gather her poults (chicks). When a turkey is flying up or down from his roost or across a creek, (or just flying) the sound that they make is called a cackle. It's only heard when they are moving. A purr is a soft rolling sound that turkeys make when they are content, like at feeding time. They will also cluck and purr which is "flock talk" and can be amplified at times. Again, it just means you have a happy group of birds. 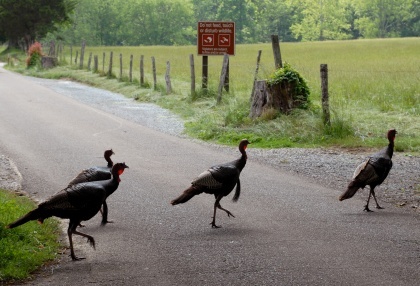 When young turkeys are lost, the sound they emit is called kee-kee. Adult turkeys will also use a variation of this sound. If someone is talking about a kee-kee run, it is a kee-kee with a yelp at the end.